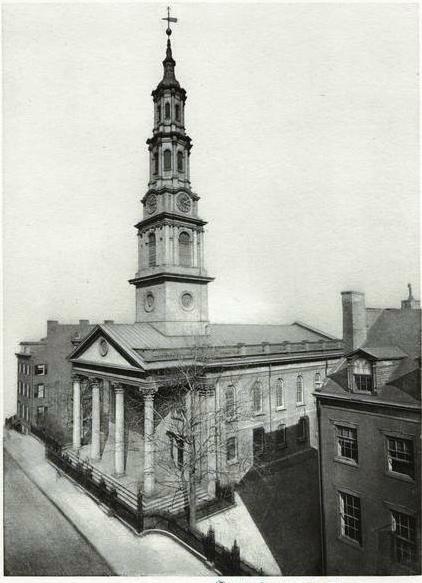 In the first years of the 19th century, Trinity Episcopal Church owned vast amounts of land north of the city, granted by the British Crown in 1705. The Board of Trinity moved to begin development of this unused land, known as the Church Farm, and on September 13, 1802 resolved to erect a chapel of convenience. Trinity was undeterred. The chapel was intended to be the focal point of what would become an exclusive residential neighborhood, centered on a private park. Architect John McComb had recently completed the design for New York City’s distinguished City Hall, with Joseph-Francois Magnin, which was currently being constructed. The church gave the commission for St. John’s Chapel to McComb. 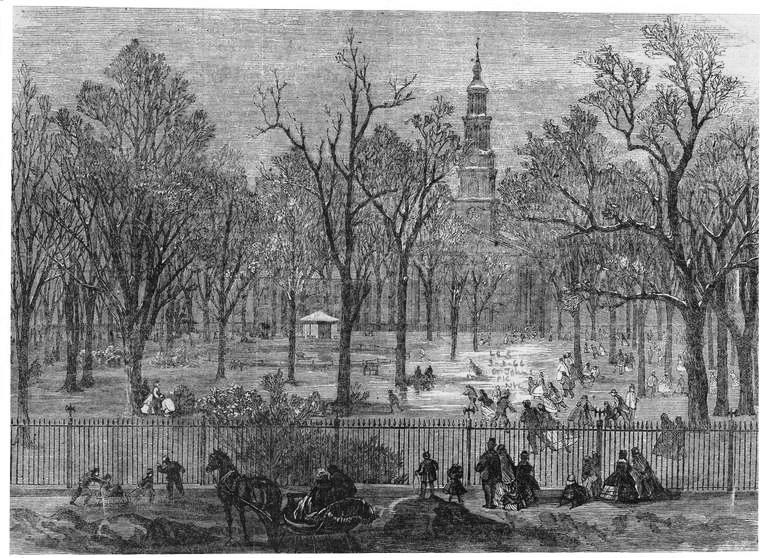 Construction began later that year and as the church rose, the previously-worthless Hudson Square was converted to an elegant park. By the time the chapel was completed in 1807, St. John’s Park had become accepted as a fashionable area and elegant Federal mansions were being constructed. John McComb’s completed St. John’s Chapel was magnificent. A near-copy of London’s St. Martin-in-the-fields, it cost a staggering $172,833. The organ, ordered in Philadelphia, cost another $6,000. In 1908 the Architectural Record would call it “in the straitest sect of the British Georgian of its period.” A prominent double-height portico, supported by carved Corinthian sandstone columns sheltered the entrance. Above, a glorious 214-foot tower rose. “The interior of St. John’s, with its towering side columns and high, wide, sweeping arches, is in keeping with the imposing exterior,” the New-York Tribune commented a century after construction. St. John’s Park, anchored by the chapel, became the most fashionable residential neighborhood of the city. Well-dressed ladies strolled its paths and elegant carriages discharged the most respected citizens at the doors of surrounding homes. Trinity Church was not only in the business of saving souls, it was in the business of business. 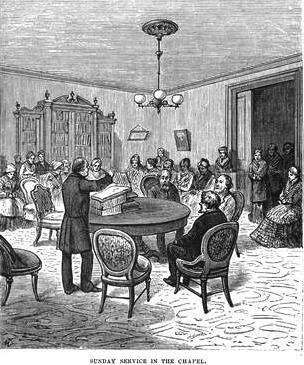 Two years after the end of the Civil War the church shocked New York City by selling St. John’s Park to the Hudson River Railroad Company. The company immediately began plans to replace the refined private green with a freight terminal. A stereopticon slide captured the destruction of St. John's Park, to be replaced by a freight terminal, around 1868. One-by-one the grand brick homes were either razed or converted to warehouses and offices as their owners fled the neighborhood. In 1890 The Real Estate Record and Guide noted that fashionable citizens thought “it vulgar to live among the packing boxes, and to inhale the odor of fresh fish and tarpaulins.” John McComb’s refined Georgian edifice now sat among decidedly unfashionable structures. With Dr. Brown’s death in 1909, the cause was taken up by other concerned citizens as Trinity moved closer to demolition. 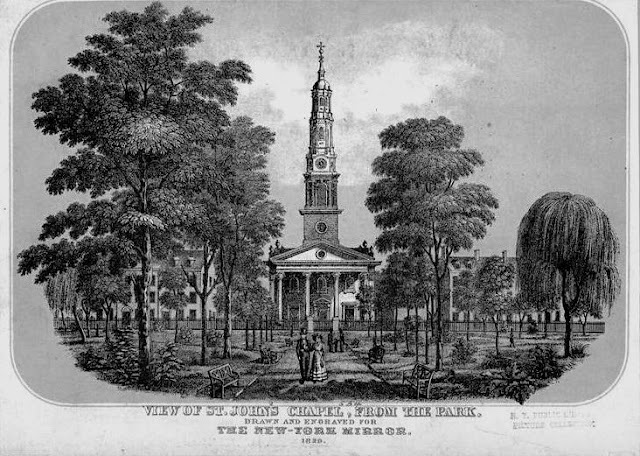 In April of that year John Burke “and others” filed an injunction against the “Rector, Churchwardens, and Vestrymen of Trinity church, and others,” to prevent the destruction of St. John’s Chapel. 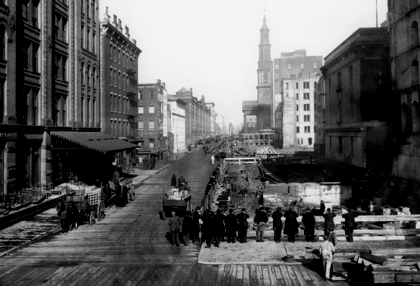 Things worsened in 1912 when the Board of Estimate planned the widening of Varick Street – the portico of St. John’s Chapel sat squarely in the path of the road improvement. Yet, Borough President George McAneny took up the church’s cause with a brilliant scheme. He proposed that the structure be preserved with the sidewalk simply running under the portico. The plan was based on the identical treatment of St. Michael’s and St. Philip’s churches in Charleston, South Carolina. The city was in agreement. All that was necessary was the consent of the corporation of Trinity Church. But the Church was still in the business of business. 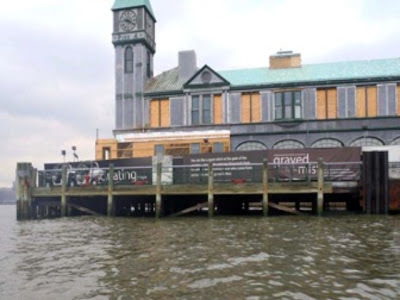 The land on which the century-old structure sat—once virtually worthless—had become exceedingly valuable. Writing in The American Architect in 1912, Ransom W. Haddon recognized the looming danger. Intent on realizing the property value under the church, Trinity announced it would donate the building to anyone buying the land. 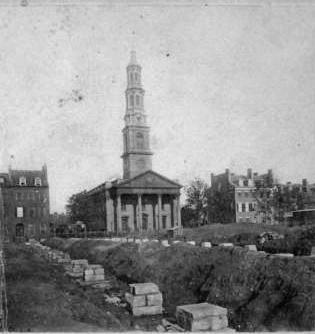 The chess game went on as the widening of Varick Street inched closer and closer to St. John’s Chapel. 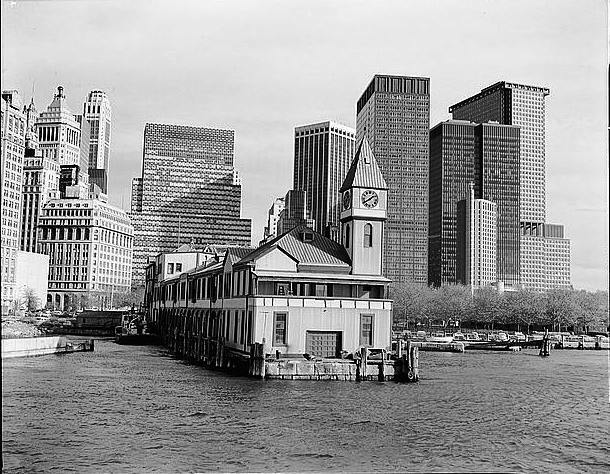 Within two years Trinity Church Corporation got its wish when it sold the land to Adolph Pricken of Coastwise Warehouses for a $2 million warehouse. A century before the area would be called Tribeca, architect, Jacob Weber designed a two-story loft and store building at No. 172 Duane Street. 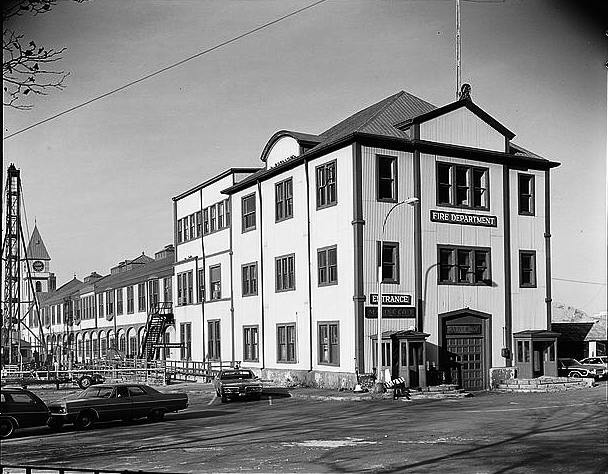 Accounts differ regarding the original purpose – most sources saying it was home to the World Cheese or Weber Cheese company; others putting an importer of rare lumber into the building. In any case, Weber outdid himself on the delightful design. Duane Street was lined with other Jewish-owned businesses, like Simon Rawitzer’s woolen rag company and Nathan Levy’s soda-water fountain. The men necessarily used the sidewalk to bring goods in and out of their establishments and in 1891 were the victims of extortion. Three years later Isidor Berg testified before a State Senate Committee that he was frequently threatened with arrest. “I got tired of being fined, so I spoke to a policeman on the beat about it, and asked him what I could do to avoid trouble. He told me he would send a man to see me. “The man came around the next day, and said he thought he could arrange matters so I would not be annoyed. I asked him what it would cost, and he said $50 for the year. By the 1990s Tribeca was no longer home to butter and egg dealers or rag traders. Although the second half of the century had been rough on the area – cast iron facades in the 1970s and 80s were rusted and brick buildings were grime-covered—by now trendy restaurants and high-priced residential lofts were replacing industrial space. The Landmarks Preservation Commission was considering the entire section as an historic district. Polsinelli later said that while the façade was in a “sinful state of preservation” he recognized its historic and architectural importance. The façade was dismantled and sent to Utah for restoration. In the meantime, the 19th century loft was replaced by a sleek glass block-fronted building with no hint of history. In 1991 the impeccably restored façade was set in place, six feet in front of the new building. Called by the Historic Districts Council “nicely designed and detailed to make a small building impressive,” it now served as a gateway. Polsinelli and the building’s owner received wide-spread congratulations for saving the cast iron front and incorporating it into the new design. Yet preservationists held back a bit. Calling the practice “facadism,” – a term never meant to intimate applause—they mourned the loss of the original structure. Hip hop impresario Damon Dash took a long-term lease on the building, labeling it DD172. Here he ran a video agency, web design firm, a magazine and an art gallery until June 2011. The building’s owner now had new, more ambitious plans. He called back Vincenzo Polsinelli to create a four-story, 8,000-square foot single family residence behind the 140-year old façade. 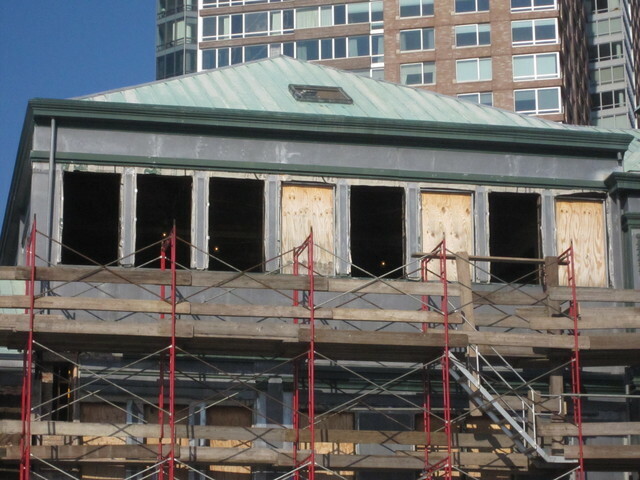 But by now the Tribeca West Historic District was firmly in place and changes required approval. The architect is reworking his plans which, as originally designed, would “reduce the historic building to being a pretty little pendant on the large new structure,” as the Historic Districts Council put it. In the meantime, the exquisite ruins of No. 172 Duane Street sit like a movie set in front of a building with which it has nothing in common. Many late Victorian architects rightly felt themselves the heirs to all that had passed before them. 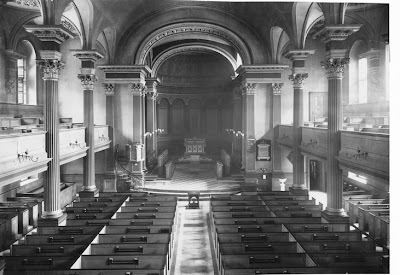 That philosophy led to the design of structures described as a “happy marriage of styles.” And so it was with R. H. Robertson’s St. Paul’s Methodist Episcopal Church on West End Avenue at 86th Street. Thirty-six years after moving northward to Fourth Avenue and East 22nd Street in 1857, the congregation decided to move one last time—this time to the rapidly-developing Upper West Side. 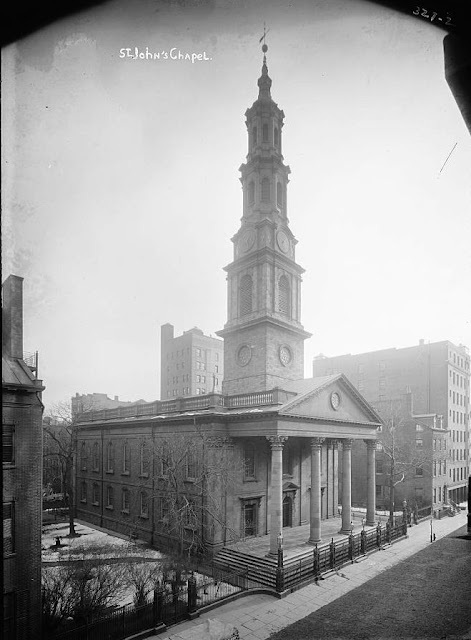 St. Paul’s white marble church building was “known for many years…as the most expensive Methodist Church edifice in the city,” according to The New York Times. The congregation sold it in 1893 for $304,000 and held services for a time in the chapel of the Methodist Book Concern on Fifth Avenue at 20th Street, along what was called “Pater Noster Row,” while its next move was discussed. Construction on the new church was begun in 1895 and the ambitious project was not completed until two years later. 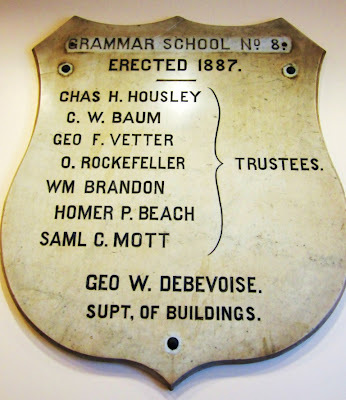 Inside the cornerstone, laid on June 27, 1895, were the old 1857 cornerstone, a piece of the marble from the old church and various contemporary documents. Working in buff-colored brick and terra cotta, Robertson used the barn-like prototype of an early Christian basilica as his central structure. To it he added a soaring octagonal bell tower, inspired by German Romanesque churches, with Renaissance balconies at the belfry and deeply-framed roundel window. Inside, “the audience room is of octagonal shape with unequal sides,” reported The Times. “There is a gallery on three sides, and the walls above the galleries are supported on a series of arches. The ceiling is an elliptical dome, with panel ornamentation.” The church, finished at a cost of $300,000, was designed to seat 1,200 worshipers. St. Paul’s was not the only Methodist church in the Upper West Side. Seven years earlier St. Andrews Methodist Episcopal Church had been completed, a hulking Romanesque Revival style building on West 75th Street and as St. Paul’s was being completed, Grace Methodist opened in 1896 on West 104th Street. But while row houses were being built at a phenomenal rate and development of the neighborhood seemed unstoppable, eventually it would become evident that there were not enough Methodists in the area to fill these grand buildings. 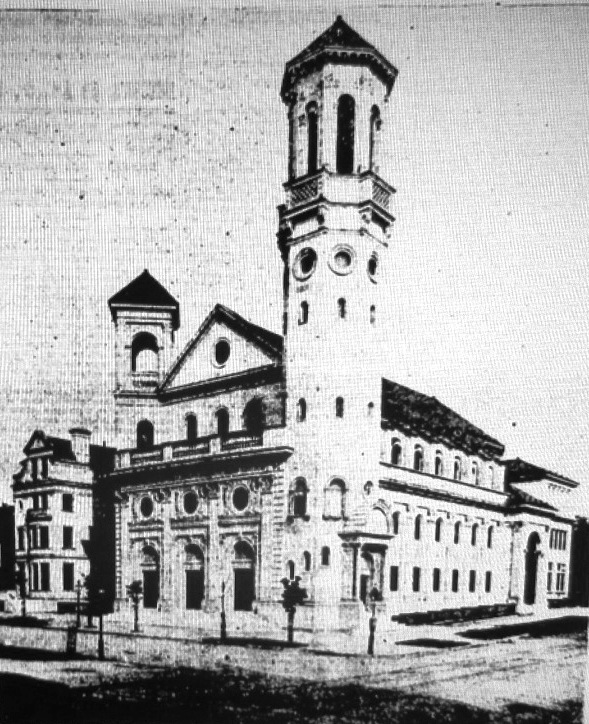 By 1937 the over-optimistic building of the Methodist churches on the Upper West Side was painfully evident and on November 7 Bishop Francis J. McConnell announced the merger of St. Andrew’s Methodist Episcopal Church with St. Paul’s – resulting in the Church of St. Paul and St. Andrew. St. Andrew’s building was sold to the West Side Institutional Synagogue. By the time Samuel B. Ruggles' ambitious vision of Gramercy Park was becoming reality in the 1840s, Dr. Valentine Mott had created quite a reputation for himself. 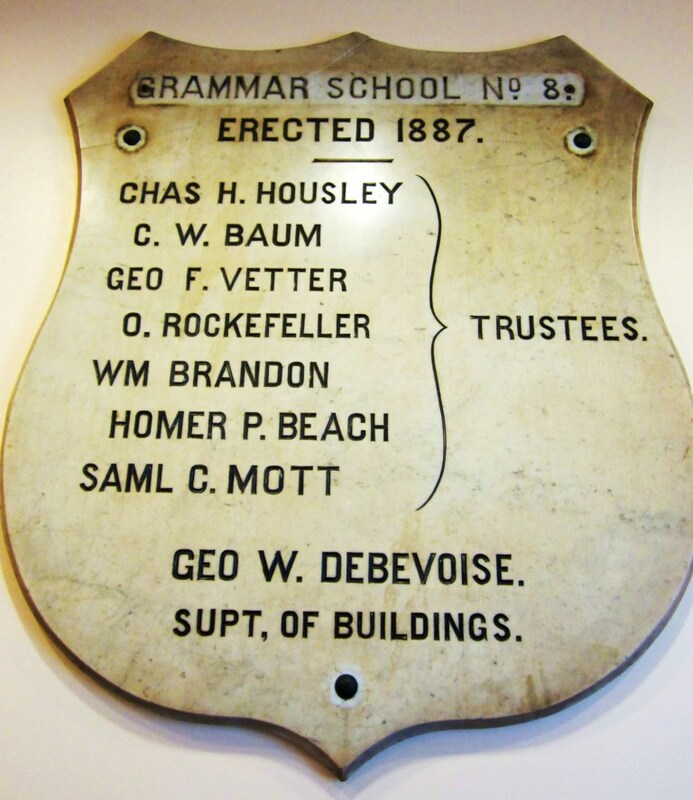 Born in 1785 in Glen Cove, Long Island, Mott came from a Quaker medical family. After earning his medical degree at Columbia Medical College in 1806, he studied surgery in London under the renowned Sir Astley Cooper. Mott showed such potential that Astley appointed him assistant in surgery almost immediately. Three years later he returned to New York, recognized as a skilled surgeon at a time when operations were painful (anesthesia was uncommon at best) and often fatal. The doctor was the first to successfully perform surgeries previously considered impossible. The fact that Mott was ambidextrous and could operate with either hand no doubt contributed to his success. 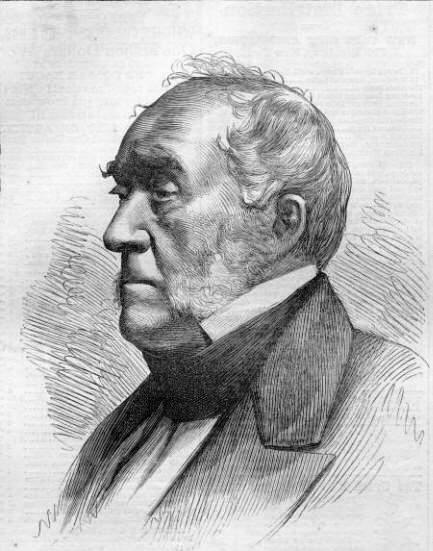 He garnered international fame when he performed successful operations on arteries, including his 1818 surgery on a tiny vessel two inches from the patient’s heart. It was the first time ever the daring surgery had been attempted. Two years later, with three other doctors, he founded the Rutgers Medical College. Beginning around 1830 he devoted his time mainly to lecturing, attaining professorships at Columbia, Rutgers Medical College of New Jersey, and the University of the City New York. 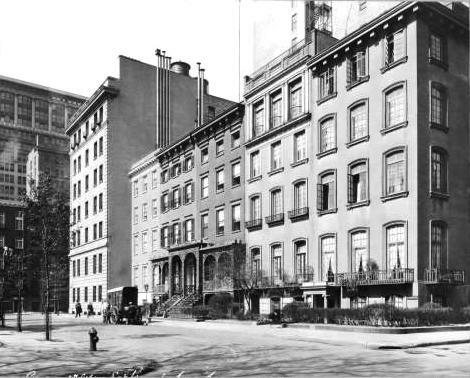 In 1844 Gramercy Park had been landscaped and gracious residences began rising around it. Ruggles intended his enclave to rival the elegant St. John’s Park where many of the city’s wealthiest citizens lived. And he succeeded. 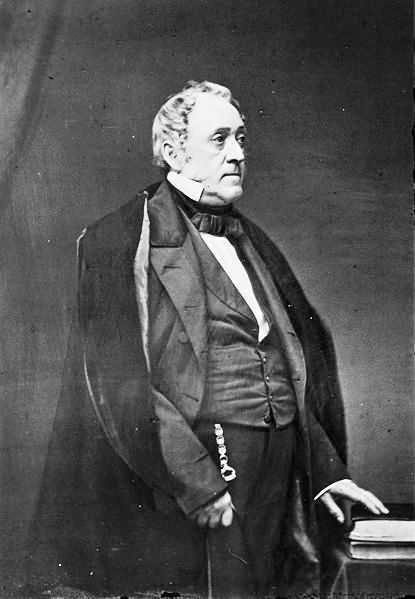 In 1849, the same year that Valentine Mott was elected President of the New York Academy of Medicine, he moved into the new No. 1 Gramercy Park, a dignified four-story Italianate brownstone mansion. Mott and his wife, the former Louisa Dunmore Munn, reared nine children in the house. Life changed for the family when civil war broke out in 1861. The carefree evenings of entertainments and medical discussions in the library drew to a close. Perhaps the sole bright spot for the Mott household that year was a visit by the Prince de Joinville. Valentine Mott had been “intimately acquainted” with the prince’s father, Louis Philippe, according to The New York Times and in 1841 the prince had been entertained by Mott. 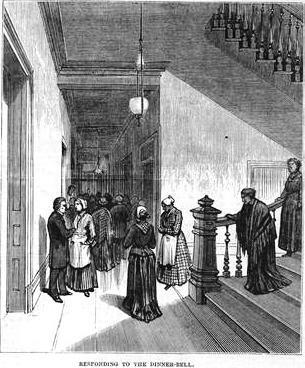 Before leaving for Washington on September 17, 1861, “a visit was paid by the Prince and part of his suite to old Dr. Mott, in Gramercy-park,” reported The Times. Mott’s son, Thaddeus, enlisted in the Union Army and was assigned as captain of artillery. He would subsequently earn fame for his valor and military expertise. For his part, the 75-year old Valentine Mott dedicated his full attention to the war effort, offering President Lincoln his services. As consultant to the War Department, he gave advice on the administering of anesthesia in battlefield hospitals. Valentine Mott died in his bed at No. 1 Gramercy Park on April 25, 1865; a little over a week after the assassination of Abraham Lincoln. The story is often repeated that Mott died from the shock of the president’s death; a possibility given the doctor’s history of a nervous system disorder and his advanced age. Harper's Weekly accompanied Mott's obituary with the above sketch. In place of the brownstone stoop, a rather handsome portico was added. In the modernization the stone frames of the windows were shaved flat, as compared with the once-matching house next door. Where the “high stoop” had been, the entrance was lowered to the English basement, below street level. 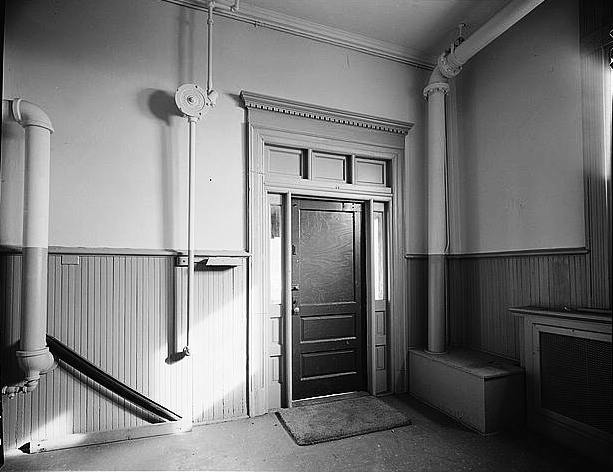 An attractive brownstone portico was added and the original doorway became a window. 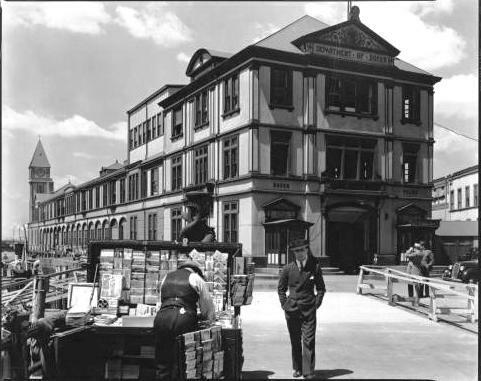 The apartments became home to financially-comfortable tenants like William G. Sickel, vice-director of the Hamburg-American Steamship Line and artist W. T. Benda. Marks sold the property in July 1945. The buying syndicate purchasing the house “plans more extensive alterations in the near future,” reported The Times. In 1959 the house still had ten apartments—two each on the first through third floors, three on the fourth and two (one including an artist studio) in the basement. Today luxury coops are home to residents such as Tatiana von Furstenberg, daughter of fashion designer Diane von Furstenberg and Prince Egon of Furstenberg; and interior designer Sara Story. Story purchased her 3,000 square foot, three bedroom apartment from children’s book author Sarah Kilborne for just under $1.5 million. The exterior of the Mott house was used in the 1991 film “Delirious” as the home of actor John Candy’s character Jack Gable. While the wide stone stoop and window details were sadly removed; the mansion of the 19th century’s most celebrated surgeon remains, externally, essentially preserved. 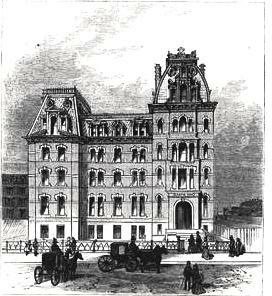 The Lost Chapin Home for the Aged and Infirm - 66th Street and Lexington Ave.
Edwin H. Chapin was the pastor of the Fifth Avenue Universalist Church when his wife and a group of twenty church ladies began their project of what today might be called a retirement home. On May 1, 1869 Mrs. Chapin applied for the Act of Incorporation for the Chapin Home for the Aged and Infirm. That goal of creating “home” as opposed to institution was foremost in the minds of the women. In 1871, having already collected over $75,000 in donations, they commissioned architect Stephen Decatur Hatch to design the Chapin Home. Hatch was directed to create a homey, distinguished mansion where the elderly could feel at home. Hatch would be remembered for his French Second Empire buildings like the grand Gilsey House Hotel on Broadway that was currently under construction. His Chapin House would follow a similar design. Nearly an hour north of the city, it would be surrounded by fresh air and countryside. 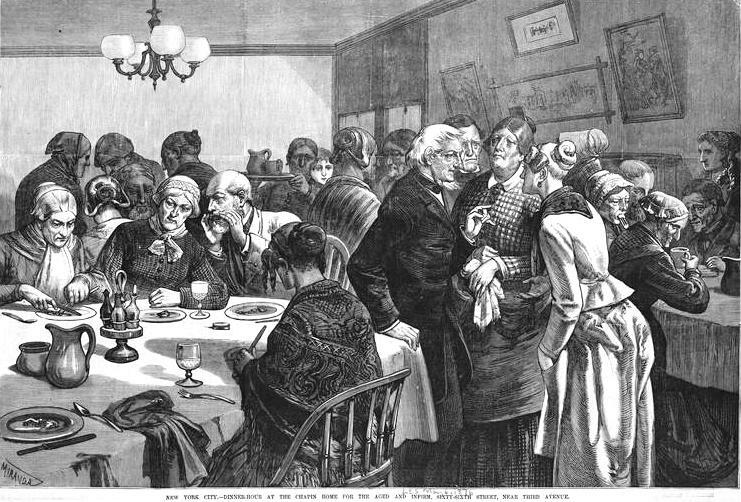 As the building rose, various fund raising events were held such as a fair in the armory of the 22nd Regiment. 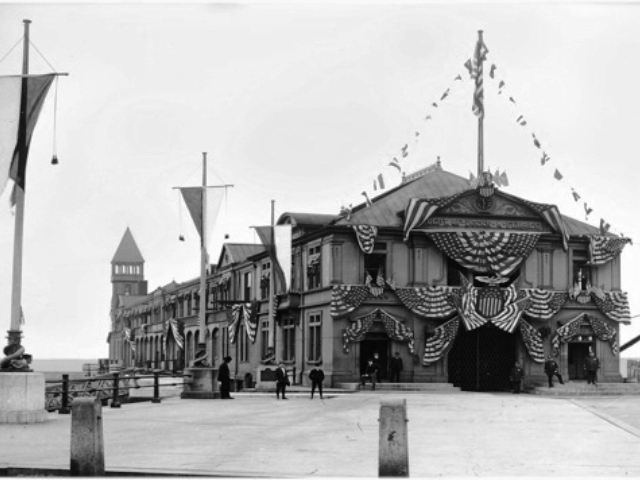 The fair, which began on April 10, 1871 and lasted for several days, netted about $10,000. At the same time, over 50,000 subscriptions had been promised and the State Legislature gave a gift of $10,000. The women’s dream became reality on March 3, 1973 when the mansion was finally completed and dedicated. Hatch’s impressive structure was the last word in residential vogue with a roof line of various heights, elaborate two-story mansard caps – one rigidly straight, the other gently bowed—and a deep, arched portico. To be eligible for admission, applicants had to be at least 65 years old. 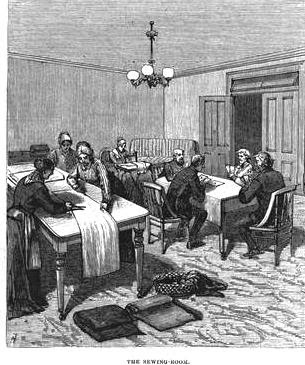 An agreement was signed that transferred all their property to the institution and a down payment of $300 was made, along with a $50 burial fee, $5 physician fee, and vouchers of respectability. A similar case was heard a year later when Lucius W. Tilden sued to be let back into the Home. After living there a year with his wife, he found the home less than Currier & Ives perfect and spread accusations and rumors about the managers. Unfortunately for Tilden, the judge decided in favor of the Home and he was forced to find another place to fight the harsh waves beating against the aged poor. On March 3, 1893 the Chapin Home for the Aged and Infirm celebrated its 20th Anniversary. The Home was opened for public inspection, including the rooms of the residents. “Every room was as neat as wax, and most of them were tastily decorated with fancy work,” reported The New York Times. The oldest resident was Mrs. Ann Durand, 93 years old, who exhibited a “handsome patch-work quilt” she had made. 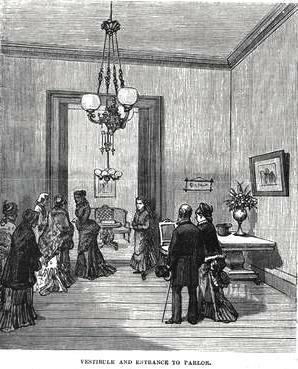 Other handiwork by the residents was displayed in the reception parlor. A “comfortable and commodious” elevator was installed in the house in 1894, a gift by Mrs. Washington L. Cooper as a memorial to her father, George A. Dockstader. Mrs. Cooper’s donation was no doubt greatly appreciated by the elderly residents, some of whom were saved a five-story climb to their rooms. The Home continued to survive on generous donations and bequeaths. In 1907 it purchased the land from the city for $5,000. It was a brilliant move. Within three years a new, modern Chapin Home for the Aged and Infirm was being planned in Queens, New York; what The Times called “splendid new buildings to be erected on the heights.” By 1912 the great French Empire mansion sat empty. In the meantime, the Chapin Home put the property up for sale. The old mansion and the land which the Home had bought for $5,000 in 1907 was priced at $1 million. The old Home was not only a splendid surviving example of Stephen D. Hatch’s elegant Second Empire designs; it was a groundbreaking concept in the dignified care of the elderly. The Chapin Home for the Elderly and Infirm, in striving to create “a home,” planted the seed of the progressive-thinking retirement homes of today.